Hi im currently with MyRepublic ISP on the Gigatown pure plan i think my speeds are slow as my friend with snap gets over 800Mbps down on speedtest every time while on Gigatown plan. I have contacted MyRepublic and they are moving me to a new link on friday with more bandwidth. What do they mean by this? Also i have ran tests plugged straight into the ONT same results, my wiring is all cat6 and my router is a Netgear R7000 witch is more than capable. Any info or suggestions is much appreciated. 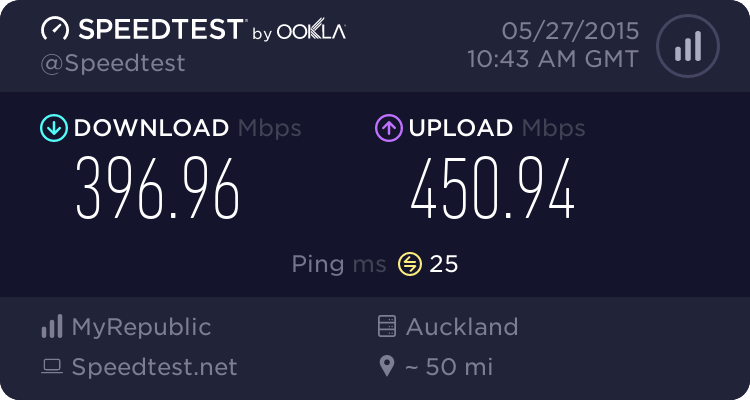 Please post your Gigatown speedtest so i can compare. What are you trying to do that is saturating your link (other then speedtests)? 400 mbps isn't really slow (albeit not 1000 mbps), honestly I wouldn't worry about it unless you have like 20 people in your house or you are trying to download the entire internet. My friends are on Gigatown with Snap and they get about 40/40 (2.4ghz Wifi being crippled by a b/g device). what are you doing that you NEED 1gbps down? ive not seen anyone get close to the advertised speed. is your friend using the same router? why not ask them if you can try their router on your connection, thats a really easy test to see if its the connection or the device. also try your device on their connection. First and foremost - speedtest.net results mean very little in the real world. QoE is far more important than raw speed. There are also plenty of reasons why speeds could vary. Without some real world testing and diagnosis to show there is actually an issue, my response to such a post is really a case of wondering what the actual issue is. We should not be questioning the OP about why he needs the speed he pays for. However, my advice would be to wait until the ISP has adjusted your connection, on Friday you say. My guess, maybe you are on a saturated connection and MR needs to buy more bandwidth or load balance existing connections more carefully . I think the issue is that the OP is never getting 1Gbps. This is not a case of temporary slowdowns, rather a permanent issue. You'll max out at 940Mbps assuming you hit a router somewhere along the way with an MTU of 1500 (highly likely, most of the Internet). Very few routers support routing above 800-900Mbps so CPE becomes a common bottleneck. Backhaul from Dunedin to Auckland is expensive. Wouldn't surprise me if most smaller providers such as MR put in 1gig, 2gigs at most of backhaul capacity. speedtest.net results are iffy at best on higher than 200Mps accesses. Yes, you will see 930Mbps+ results from time to time, I see hundreds of them looking at the logs of the 3 Spark Speedtest.net servers, but there are so many factors at play I don't expect anyone to fully understand how you end up with any given speedtest.net result. If you don't understand how the test is done and the result is calculated, then you're unlikely to be able to make a sensible comment about how this may affect you, or even if there's a network event/configuration/congestion issue affecting you. Hint: speedtest.net testing discards 40% of the results for "reasons" and the end number is NOT a direct measurement of throughput. It's an estimate of possible throughput based on sampling a number of short tests. Now, I would bet that if you were doing UDP iPerf tests you'd have different numbers. If you're running third party firmware your NAT throughput goes down - DD-WRT state around 300mbit on this router.